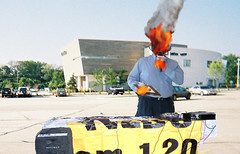 Phoenix conservative talk show host Rory McVear appeared to spontaneously combust while doing a live broadcast from his “Myth of Global Warming Rally” in the parking lot of the Sunwest Shopping Center in Scottsdale. McVear, host of the popular call-in show “The Real Story With Rory”, held the outdoor rally primarily to protest the success of Al Gore’s film “An Inconvenient Truth” which is currently playing at the Sunwest 16 Stadium movie theater. Transcripts show McVear was doing an imitation of Al Gore at the moment he burst into flame. “Hi, I’m Al Gore, tonight I’d like to scare you all to death so I can start my ‘08 campaign for president of the...ARRRRGGGHHHHHHH!,” said McVear as his body was suddenly consumed by flame. I've heard of carrying a torch for something but becoming a torch is a little over the top. I have always said you really need to get "fired up" over your beliefs but this is a bit extreme. I'll bet the maintenance people are going to be really pissed at having to clean up such a big grease spot.